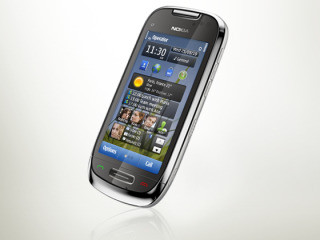 Mobile phone operator Three has announced it is to stock the Nokia C7 in the UK when it is released later in the year. The Nokia C7 is a slimline handset, measuring just 10.5mm thick and is just one of a new wave of phones which come packing the new Symbian^3 OS in the mid-range market. The Nokia C7 also comes bearing a 3.5-inch nHD (640 x 360 pixels) OLED screen with Clear Black Display and 8GB of internal storage. Couple this with HD recording and the fact that it will be £290 SIM free and this should be a decent mid-range device that's likely to come free on a 3 contract. Speaking about the news, Sylvia Chind, Head of Branded Devices at Three, explained: "The Nokia C7 is a great addition to our smartphone range. "Our customers know how to make the most of our fast and reliable 3G network. Pairing the Nokia C7 with our network gives our customers the best Symbian^3 experience possible. "We'll be announcing dates and pricing shortly." Three isn't the only carrier for the Nokia C7 - O2 announced earlier this month that it will also be stocking the device, which is still yet to recieve a UK release date.